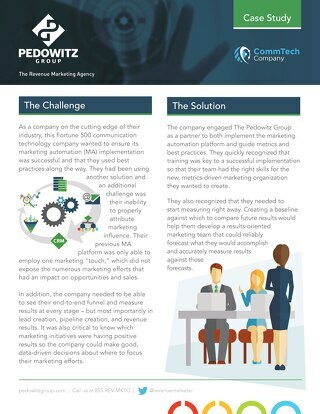 This company engaged The Pedowitz Group as a partner to both implement the marketing automation platform and guide metrics and best practices. 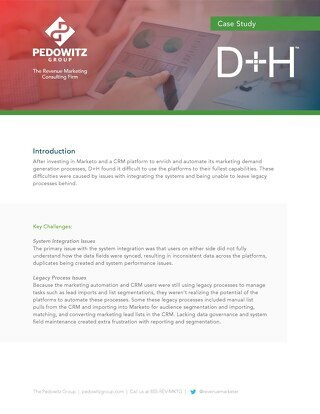 Learn how TPG helped D+H identify enhancements to be made in their processes and technology systems and how we worked together to make optimizations that created consistent data & efficient marketing. 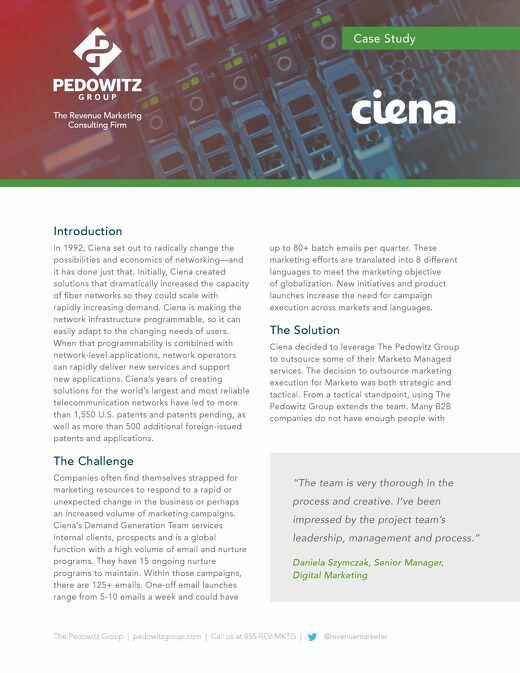 Learn how a Fortune 500 Financial Services client streamlined marketing processes for campaign execution. 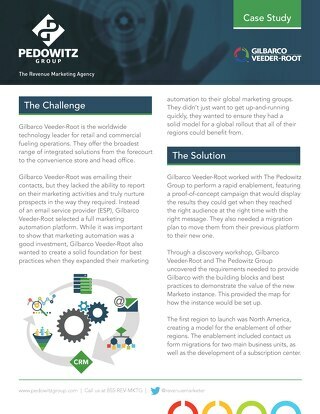 Gilbarco Veeder-Root worked with TPG to perform a rapid enablement, featuring a proof-of-concept campaign that would display the results they could get when they reached the right audiences. 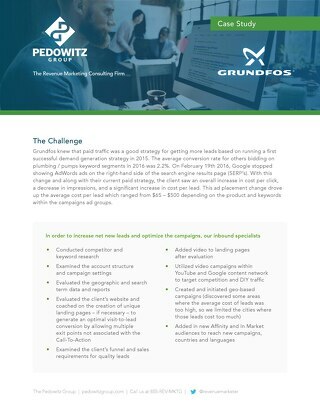 Learn how Grundfos optimized their paid search campaigns with the help of The Pedowitz Group. 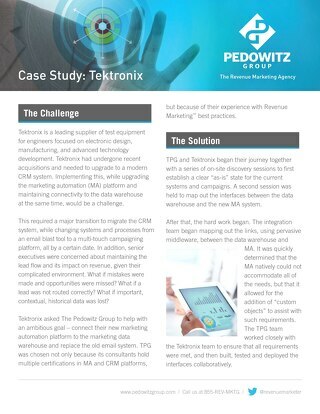 Read how The Pedowitz Group (TPG) implemented a multifaceted solution to achieve their goals. 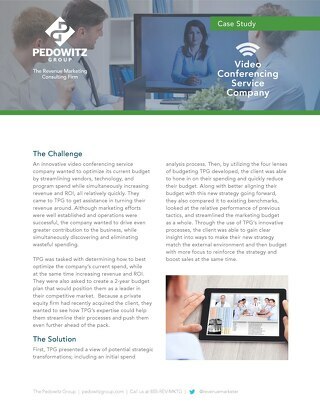 Learn how one company used TPG’s methods to transform their business into a profitable one in just 2 years. 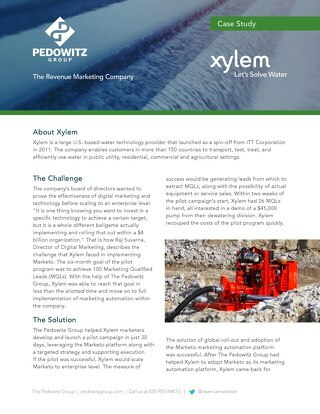 With a time frame of only 6 months, Xylem needed to integrate a Marketing Automation Platform, launch a pilot campaign and achieve 100 Marketing Qualified Leads. 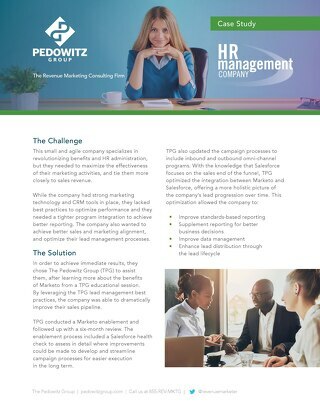 The need for efficient processes, local compliance, and effective on-boarding lead Zoetis to seek help from The Pedowitz Group. Together, they deployed a successful International Center of Excellence.